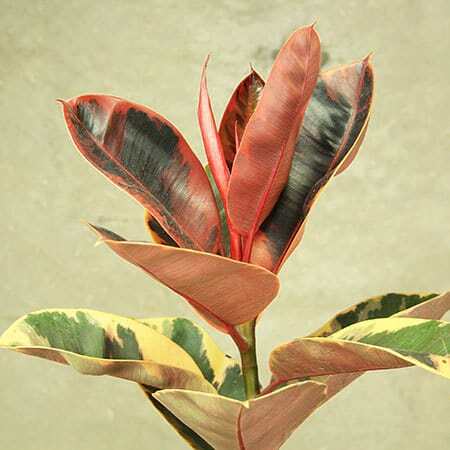 Also known as a varigated Rubber Tree, this tri-coloured beauty is truly unique. Presented in a black tin pot, it makes a fab alternative to sending fresh flowers and lasts a lot longer too! This is a wonderful gift for a client or cherished relative that loves gardening and caring for plants. To keep the colours of the leaves strong and defined, we recommend placing your Ruby plant in a location where it can receive bright, but indirect light. You need to keep the soil evenly moist but not soggy. Feel the soil before giving it a drink - about once a week is a good place to start (if the top inch of the soil feels moist, check back in a few days). 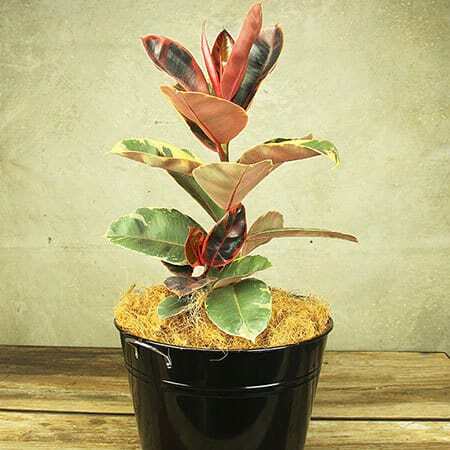 Order your Ficus Ruby plant delivery Sydney wide via our online florist shop or by calling the team on 1800 66 66 46. If you would like to send a plant along these lines outside Sydney, we recommend calling us for advice and assistance on 1800 66 66 46. Tip: If you really want to make an impression, consider teaming your plant delivery with a bottle wine or bubbly from our range of quality gift additions!